One of Kyoto's most popular attractions is to the north of the city. 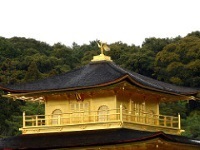 The Golden Pavilion (Kinkakuji) is a three-storey pavilion covered in gold leaf, glittering in the waters of a calm pond and surrounded by beautiful gardens. Kinkakuji was built in 1397 as a retirement home for Shogun Ashikaga Yoshimitsu, who lived there in luxury until he died in 1408, after which the building was converted into a Zen temple. In 1950, a monk burnt the pavilion down and it was not rebuilt until 1955. Today it is covered in gold leaf five times thicker than the original coating and presents an awesome sight. The pavilion is worth visiting at any time of the day and in any season - in fact, it is strikingly magnificent in winter, when surrounded by white snow. Although sunset can be particularly special, because the temple glows in the setting sun, the popularity of the place means that there are often big crowds and the best time to visit to really experience the tranquillity and beauty of the pavilion is early in the morning. A short walk from the pavilion is Ryoanji, Japan's most famous Zen rock garden, laid out in the 15th century. A veranda overlooks the garden in which 15 rocks are set among raked white pebbles.